Those of you reading my book may have guessed that, when I said in the Oct. 24 post I was leaving Queensland, I meant literarily, not physically. I’m not actually in Australia at the moment. I’m simply following the journey recounted in Waltzing Australia. So I am leaving writing about Queensland behind for the time being, and am turning now to sharing images and supplemental trivia from the Northern Territory. However, before I move on, I thought I’d share a poem I wrote before I went to Australia the first time. The reason it seems appropriate to share it here is because, while my reaction to Queensland may have been a revelation, my reaction to the Northern Territory verged on a rebirth. It is where I became—or perhaps I should more correctly say it is where I relearned—who I am. It was not the last lesson I would learn during my travels, but it was one of the most surprising. unknown, and yet desired above all else. part of a reality that only dreamers know. Her wildness calls, insisting that I come. that I will never be complete if I don’t go. Those who know me well are probably wondering why I’ve said so little about Australia’s food to this point. (Well, I do talk about it in the book, but haven’t said much on the blog yet.) Actually, I have written a lot, it has just been other places. For example, I did the piece below for Hungry Magazine, for whom I do some travel writing, a few reviews, an occasional photo essay, and a lot of food history. This won’t be the only Oz-centric food writing I’ll be doing here, but it will give you a good overview of why dining in Australia is not a hardship. If Americans think about the food of Australia at all, it probably doesn’t go much beyond Paul Hogan’s famous, “We’ll throw another shrimp on the barbie.” Well, they certainly have plenty of shrimp (or prawns as they are more likely to say down there) and even more barbies, but the country and its cuisine go far beyond that. Of course, there are the fabulous people, the fascinating scenery, the weird and wonderful wildlife, the glorious beaches and sophisticated cities—and those are all great reasons to go to Australia. However, I hope to convince you that Australia is also a great dining destination. First of all, it’s an island, with 80 percent of the population living within an hour of the ocean, so fresh seafood is abundant. Dine on barramundi from Queensland to Darwin, John Dory in Sydney, or whiting in the south. Sample Sydney’s splendid oysters. Indulge in succulent scallops in Perth or Adelaide. Check out the “bugs”—Balmain bugs or Moreton Bay bugs—sweet, flavorful, indigenous crustaceans that taste like a cross between crab and lobster. Look for crayfish on the menu—these are what we call rock lobsters, and they are particularly abundant in the southern states. (Crayfish are not crawfish. The Aussie crustacean most like a crawfish, or crawdaddy, is the yabbie, a freshwater creature that is larger than its American counterpart—and is also worth trying.) Prawns are varied and succulent, and some are massive, particularly in Queensland. And don’t forget the crabs. If you only get to Sydney, Doyle’s on the Beach is the place to go to sample the widest possible selection of seafood. Second, much of Australia is in the tropics, so there is a wide array of gloriously exotic fruit available, from mangoes to custard apples to pawpaws. The macadamia nut, also known as the Queensland nut, is indigenous, so they’re not nearly as expensive as they are here in the states. The farmers’ markets are a delight—and if you get to Melbourne, check out the Queen Victoria Market, a 100-year-old outdoor market that covers 16 acres. And Adelaide’s Central Market is a treat, too. In fact, all the major cities have markets that will delight you. On top of that, you have a substantial immigrant population. There was a huge influx from Europe after World War II. (Huge enough that, for example, Melbourne has the third largest Greek-speaking community in the world, after Athens and Thessalonica.) And Australia is in Asia’s backyard. Even 20 years ago, you could get octopus or hot goat curry from food vendors in shopping malls. It’s where I had my first Vietnamese food and Cambodian food, and while I’d first sampled Indonesian food in Amsterdam, I became truly familiar with it in Australia. Throw in a few ambitious, imaginative, cutting-edge chefs, and you have the makings of a diners’ paradise. I’ve been to Australia four times now. The first time was for six months, and I covered almost 20,000 miles. The return trips were for one month each. But don’t worry, even if you can’t get away long term, it’s still a worthwhile destination (though the flight over means you don’t want to consider it for a long weekend). If you wonder what I did during that first six-month sojourn, you’re in luck. As you may have noticed, I like to write, and I’ve produced a book about that initial adventure— Waltzing Australia. Yes, I’d also like to suggest that you visit Australia, but even if you don’t think you’ll ever go, I’d love to have you buy my book and read about my adventures during a trip that ranged from swimming with the crocodiles and riding horseback across the mountains to prowling through museums and searching out great food. Birdsville is a tiny town on the edge of the Simpson Desert, hundreds of miles from pretty much everywhere else. Its remoteness is, in fact, one of the things that makes it almost legendary. The Birdsville Pub features in books and songs that celebrate just how isolated one can be in the Outback. 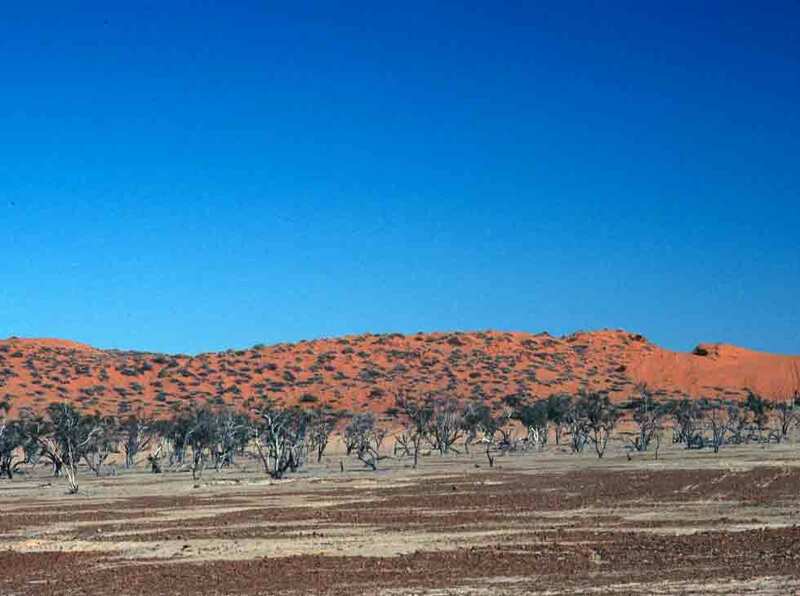 Associated with the town is the Birdsville Track, a still-rugged stretch of unpaved road that connects the town with the the next nearest town a few hundred kilometers south. As remote and unassuming as Birdsville is, there are a few activities of note. Of course, there are the Birdsville Races, which draw thousands of people to the area for a few days each year. But there are delights for those of us who like areas such as this precisely because we prefer to avoid crowds. There is a considerable amount of bird life in the area. The dune fields of the Simpson Desert are nearby. And there is a wonderful little museum—the Birdsville Working Museum—which was created by John Menzies. Menzies has gathered a fascinating collection of everything related to life in the region—and Menzies himself demonstrates much of the work, from blacksmithing to drawing water to harnessing work animals. There are sections for toys, hospital equipment, jewelry, wagons, art, and more. It is really a remarkable place. 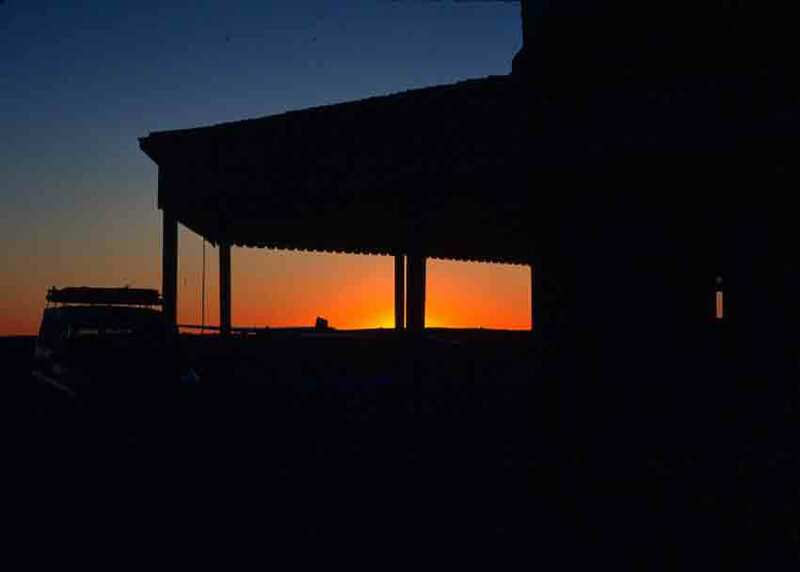 Some of the most famous shots of the Birdsville Pub show it in outline against a sunset—and being a great one for tradition, I had to try for such a shot myself. A sunset seems fitting at this point, as I’m about to leave Queensland for the Northern Territory. So farewell to the Sunshine State. One of the things that surprise people is Australia’s size. Most people (outside Australia, that is) don’t realize that Australia is almost the same size as the continental United States. However, there are only six states and a couple of territories—so most of the states are mighty large. As a result, states generally possess a geography that reflects Australian geography as a whole: good and abundant beachfront property with some nice trees and a lot of people not far from the shore, behind which lies an immense stretch of generally parched wilderness. This is certainly true of Queensland. I saw glimpses of Queensland’s less than verdant regions on my first visit to Australia when I visited Cooktown and Charters Towers. But my real adventure in Outback Queensland wasn’t until my fourth trip to Oz. I had wanted to get to Birdsville, to travel the legendary Birdsville Track, on my first trip, but getting trapped in a flashflood in South Australia for a week kept that from happening. So during one of my return visits, my friends Nikki and Richard planned a trip that would take us not only to Birdsville but all over the Corner Country, that geologically wild, wonderful, and decidedly arid region where South Australia, New South Wales, Queensland, and the Northern Territory share borders. Of the myriad remarkable things we saw during that trip, one of the most astonishing was the Simpson Desert. The image below is of Big Red, a 120-foot-high sand dune that marks the beginning of the great Simpson Desert dune field. In the Simpson, there are more than 1,000 dunes, all parallel, all running northwest to southwest, all about 100 miles long, and all standing 1500 feet apart. They look like giant waves in a red ocean. Climbing to the top of Big Red, we had an almost limitless view of the rolling, red landscape spreading toward the Northern Territory. It hardly seemed possible that this was the same state that had offered me my first glimpse of rain forest. If you read my entry on O’Reilly’s, you’ll know that O’Reilly’s is at one entrance to glorious Lamington National Park, and Binna Burra is at the other end. I had promised myself during that first trip to Australia that someday I’d get back to Queensland and spend more time in this delightful park, and I did, on my second trip. However, I did not return to O’Reilly’s, having already visited; for my second trip, I visited Binna Burra. This time, I stayed for three days, basking in the beauty. Binna Burra is a splendid, forest-wrapped, mountaintop retreat where all the buildings—and the furnishings in those buildings—were created from any trees that had to be cleared in order to build. 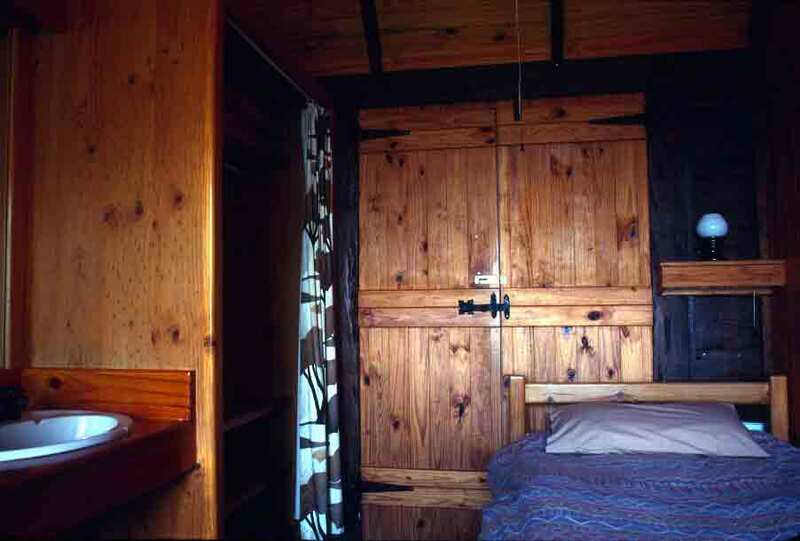 Every room has a glorious view, from the individual cabins to the large, glass-walled dining room. In the mornings, we arose to the caroling of the Australian magpies. At breakfast, glorious rainbow lorikeets (brilliantly multi-colored little parrots) came to eat outside the window of the dining room. I heard the astonishing mating call of a bower bird just outside my cabin. 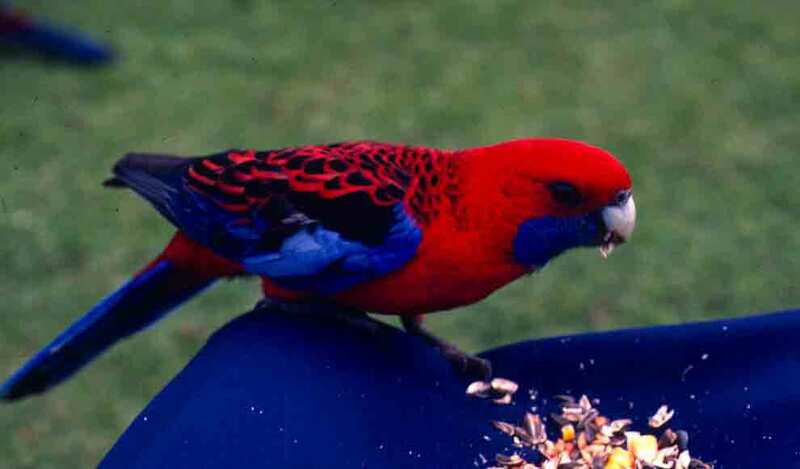 I saw a few crimson rosellas, which I had remembered so fondly from my first visit to this park. And around us were glorious vistas of the surrounding mountains and the lush greenery of rain forest. It was a simply glorious place and lived up to all my heart had remembered of my initial reaction to the rain forest. 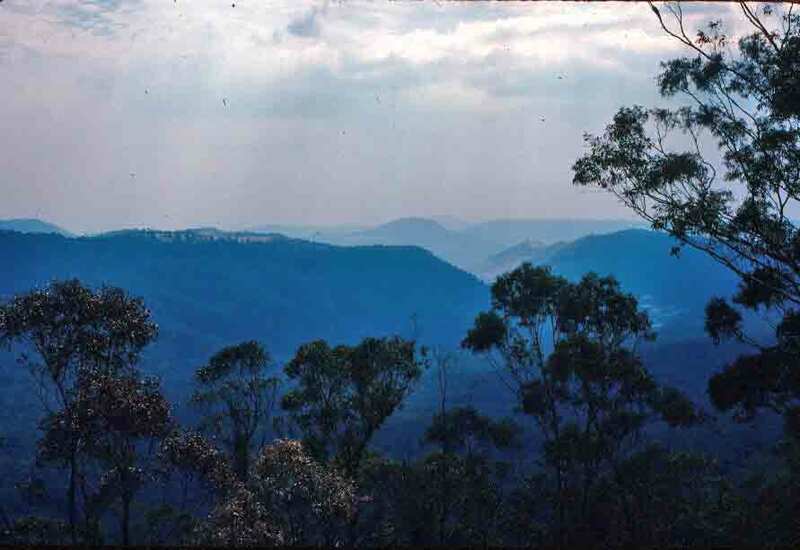 Here are photos of my room at Binna Burra—and the view from my room. Back then, so many new things were being discovered that names were getting stuck on everything in sight, whether they were accurate or not, and there was a lot of confusion. For example, the flowers we know as nasturtiums were named for the similarity of their taste to watercress; watercress is Nasturtium officianale, so the flowers got called nasturtiums. The plants are, however, unrelated. Then there are peppers (i.e., chilies), which are no relation to pepper. Same thing with jabirus—one black and white stork looked pretty much like another to some explorers, so names got picked up and dropped off all over the world. The original jabiru, the one from the Americas (Jabiru mycteria), is a large stork found from Mexico to Argentina, except west of the Andes. 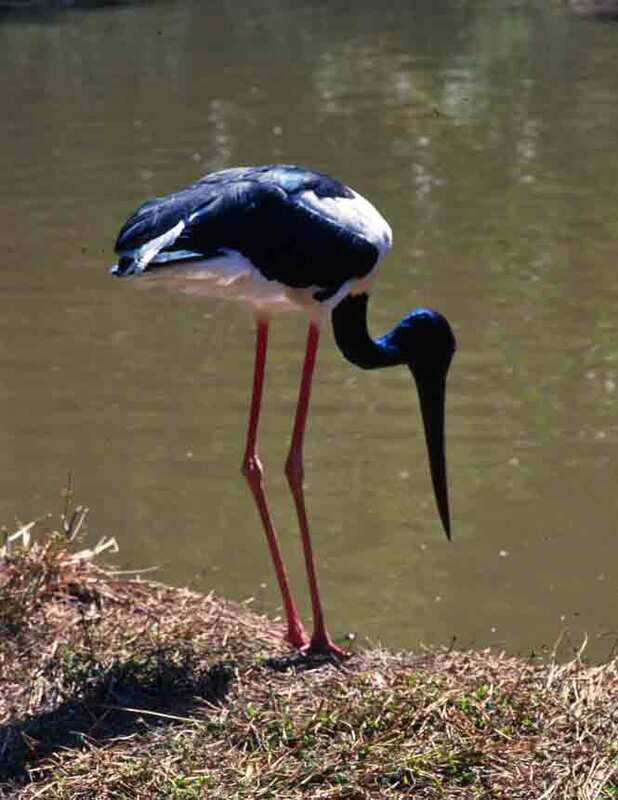 The jabiru one finds in Australia is the Asian black-necked stork (Xenorhyncus asiaticus). It is also called a policeman bird, due to its black and white coloration, which is reminiscent of a police car. This stork ranges from India and through much of Australasia. And to make things even more confusing, the term got carried to Africa, as well, where the black and white saddlebill stork (Ephippiorhynchus senegalensis) is also sometimes called a jabiru. The jabiru pictured below is one of the Australian type storks. I first saw jabirus in Queensland, outside of Cairns—but it was not the last time I’d see them. 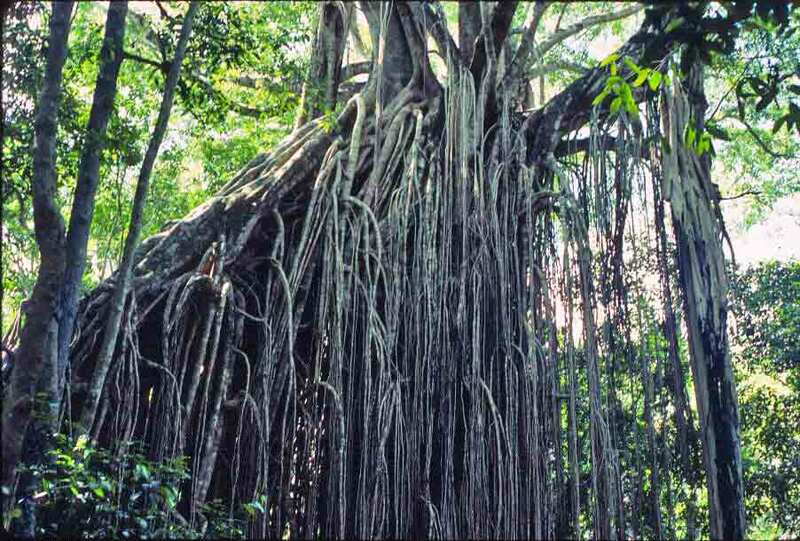 One of my stops on the Atherton Tableland was at Yungaburra, to see the famous Curtain Fig (a section of which is pictured below). While the premature death and fall of the host tree made this ficus particularly interesting, all figs are pretty intriguing. • Ficus (the botanic name for figs) is a group of about 900 species of trees, shrubs, and vines. Every single species of fig can only be pollinated by a specific species of fig wasp. As a result, there are about 900 species of fig wasp, one for every species of fig. Neither the wasp nor the fig can survive without its precise partner. As a result, when a country wants to grow a specific type of fig (say, California growing Mediterranean figs), the wasps have to be imported, too. • The figs we eat are from the common fig, Ficus carica. The fig itself is actually not a fruit, but is rather a fleshy receptacle called a syconium, which contains hundreds of male and female flowers. • Many species of tropical figs are known as stranglers. A sticky seed deposited in a high branch by a bird, bat, or animal sprouts. Roots soon descend to the ground, creating a latticework that encases the trunk of the host tree. The host is usually killed, but even if it isn’t, because it is much older than the fig (having been full grown when the fig sprouted), it usually dies before the fig. The huge cylinder of roots left behind makes it look as if the fig has a trunk. The hollow “trunks” also provide shelter and breeding sites for many of the forest’s creatures. • Of the approximately 150 species of New World figs, most (but not all) are stranglers. • Figs bear fruit all year. This steady supply of fruit provides an important resource for animals during times of food shortage. If figs were to be removed from the forest or the fig wasps vanished, there would almost certainly be a dramatic reduction in animal life.